Test the cutting resistance, viscosity, spreadability and gel strength of your cheese, yoghurt, butter or sauces. The development and quality control of dairy products are heavily reliant on texture analysis. During the development phase, texture analysis compares the texture of new formulations to existing proven products. 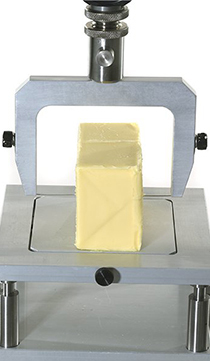 Consistency, gel strength, spreadability, tensile strength, extensibility, viscosity, creep, relaxation, cutting resistance, firmness and hardness of cheese, yoghurt, butter, sauces and ice cream are just a few of the test types you can perform by combining the TA1 texture analyzer with our food grips, fixtures, jigs and probes for dairy.